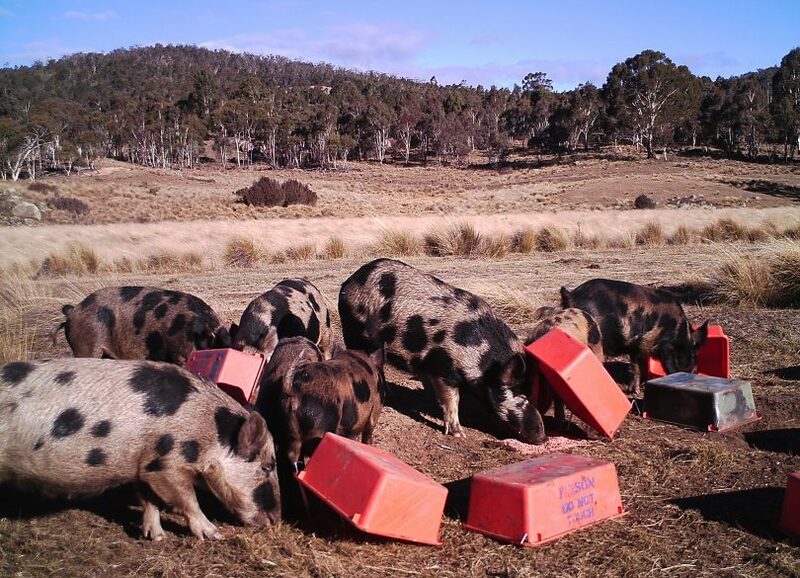 Pigs take the bait in Namadgi National Park. Photo: ACT Parks and Conservation Service. Over 275 feral pigs have been culled in Namadgi National Park, with the ACT Parks and Conservation Service completing its annual control program. ACT Parks and Conservation director Daniel Iglesias said the program, which has been conducted since 1985, was designed to stop feral pigs from causing substantial environmental damage to the park. “When feeding, pigs ‘root’ or ‘rip’ up areas of vegetation which can damage wetlands, stream banks and areas of intact native vegetation. They can also spread weeds,” Mr Iglesias said. Mr Iglesias said feral pigs were also a significant pest to farmers by ripping up valuable pasture, damaging fences and killing lambs. “Since the program began, monitoring had indicated that both the numbers of pigs and damage within the park has been significantly reduced,” Mr Iglesias said. “Along with our other efforts managing other pest species such as rabbits, the control program has been vital in helping protect the ACT’s water supply. This year, the ACT Parks and Conservation had expanded the control program beyond Namadgi to work collaboratively with 20 rural landholders in southern ACT to achieve coordinated cross-tenure pig control. “This collaboration has seen a strong uptake and been a really positive development,” Mr Iglesias said. Smaller control programs are also under way along the Murrumbidgee River Corridor, Molonglo River Reserve and areas of Canberra Nature Park. What sort of a death does that poison inflict on those animals? Wouldn’t shooting be much kinder?